Race day two has been nice and easy. The sky is 100% clear, and the weather is cool enough that some of us are actually wearing jackets. Everything is working smoothly as we are approaching our first tire change of the day. As always, check twitter for for more recent updates from the trackside. Also, we've finally gotten some pictures up! See them here on our Flickr. After our last post, the team encountered some minor electrical issues. 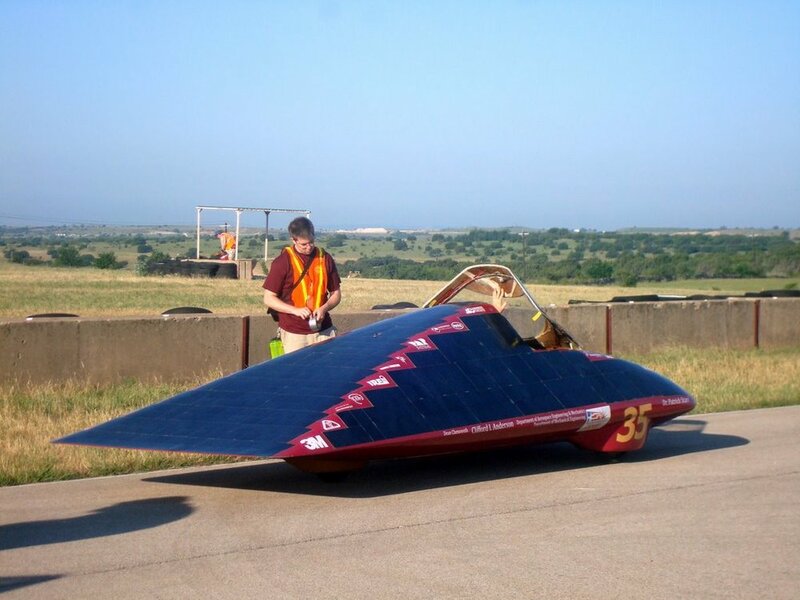 Just before 3pm, the car encountered an issue with the power trackers requiring a short stop, and a few laps later, the motor controller began overheating. These two issues cost us about 40 minutes, but we were able to get the controller cooled down and the car back out on the track. 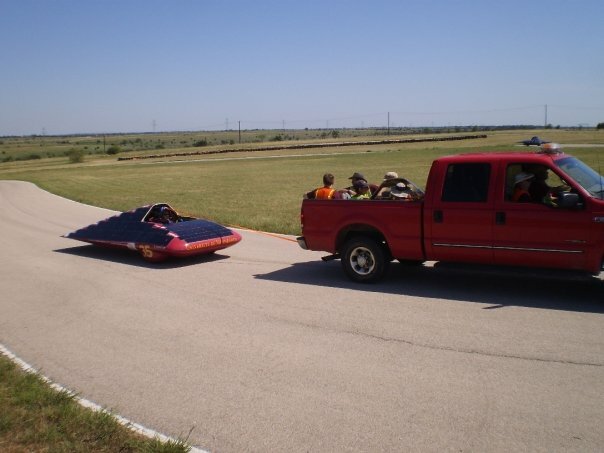 We finished the rest of the day running slightly slower laps in order to keep stress off of the electrical system. The second day of racing is over; we completed 152 laps today, bringing our total to 321. Our closest competitor is now University of Kentucky, who we believe are about 70 laps back. Kentucky is the model of "slow and steady", as although they are not as fast on the track as several other teams, they have spent well under an hour off the track over the past two days and just keep racking up the laps. Waterloo is in third behind them, and we believe that Northwestern is in fourth. Both Iowa and CalSol made it out to the track for the first time today, although Iowa has been having issues with their motor, and CalSol only drove 24 laps before suffering a tire blowout right at the end of the day. We've made some modifications to the ventilation systems in the rear of the car, and our battery is in a very comfortable state. We hope to drive a fast, clean last day tomorrow. OOooohhhh! Pictures at last! Love the electric bike, but aren't ya'll sick of PB??? Which Alex is driving (is there more than one? )Does speed have anything to do with this race or is it the number of laps completed - soonest? Also love "the pose" 'cuz it just got real - excellent shot! Have tons of fun, go sun! When you are sick of PB&J, you are sick of life. There is 10 hours of racing each day, the team that completes the most laps within that time wins. Alex Tran is a driver, Alex LaMoore is our head mechanical guy along. I'm eating a sympathy pb&j right now. Congratulations on having such a healthy lead. Sorry to hear the power trackers are having issues . . . but at least they're not going "bang!" like last year, right? Have a fantastic Friday! Thanks for the answer to my questions... I thought MY Alex was too tall for the car and I was right! Now I'm curious as to what speeds you are getting up to? Is everyone getting enough sleep? Making new friends with the other teams? Getting enough fun in the sun? I'm glad to hear your issues have been minor, Have a great day Raycing! I would just like to kindly ask you to make a correction to your post; CalSol completed 24 laps on day 2.
ps. thanks for the help you guys gave us with our motor on day 3! see you next year! Sorry for the error; I was all over the place and didn't see your earlier laps. Sorry for the mistake!